Silent Wind of Doom had the most liked content! Sorry this took so long. My grandmother fell and had to have surgery. Mix the far-off hospital stage with 12-hour days of house construction and things get behind. But I'm back. @Silence of the Rams, it took a while, but I got everything together. @NoE38, yours is the kind of delightfully schizophrenic sigs that make me try to figure out where on Earth the person is from. Love it. @45469, thanks for the info on their expanded accomplishments. Also didn't realize until you pointed it out that Do you mean "Where I Come From", or championships? I'm actually overhauling the former and am going to relaunch the thread. Although, naturally, I don't know how long that will take. @mungojerry311, oops. The first two had been in the order they were uploaded so I didn't check for the last two. As for Michigan v. Michigan State, that was just a total mental lapse. @osctheg, I knew your name sounded familiar. I'd already made one for you in 2017. But here's the one you just asked for. @bernie57, here you go. Grumble grumble. @tdawg91 @mungojerry311 @AidenT0605, there was one basketball championship. Ugh. Sorry. First I didn't get a notification of your reply, then I write out a response and the site deletes it. Do you want championships for Dayton? Is that just basketball, because that comes out to three things, one second-place tourney finish and two conference championships. A bit small for a sig, although it does work as a good size for a user avatar. Just making sure of what you want. Also, do you have a phrase specifically you want to see for the Where I Come From? I'll get everyone else done in the next day or two. What do you mean? For Australian sports, or teams? I've done some by request, such as one person's request of Essendon's championships. I got this done before Midnight, but the last request caused me to lose some time. 12:15 isn't too late. Heh... As someone on the outside looking in and just looking at a list of cups that all have big-sounding names, it's hard to parse which is the big one. Especially when it took months to realize the difference between club cup and non-club competition in UEFA. @greenday61892, you've got the largest since I've redone these and they expanded the sizes. The only reason it fit was because I moved the Revolution up and took away the Eastern Division win for the Celtics from the era where that was the conference championship. Included the two instances of the Bruins winning the trophy for the Stanley Cup non-champion. Hadn't dealt with field hockey before, but took the mark I use to differentiate hockey, replaced the puck with a ball, and curved the sticks up. Hope it's all good. @clonewars2008, did you ask me for this earlier? I definitely remember tangling with the Cup Challenge Era Stanley Cup wins. I'd just go with the actual claims of it, the winning it away from another team, but it's your team, so it's up to you. @Dalcowboyfan92 @OhiOsFan17, I usually just put them in the order they're listed. Here you go. @IndianapolisCubs2009, you should take this. I was really hoping for you guys, if you couldn't tell from my signature. Also took off the things you'd told me to earlier, but I missed it. Jeez! I somehow didn't get notifications about these posts. My computer died somewhere in the middle, there, though, so that may have done it. I'll get everything done by tomorrow. Hey, guys. Sorry I took so long. I just got back from South Carolina last night. @ItsSlothy, by Euro Cup, I hope you meant this cup. The different European championships can get really confusing for one who doesn't know the nicknames well enough. @IndianapolisCubs2009, I don't know if the trophy is the same for the Trojans, but here it is if it is. One post I had in my quoted posts from the last thread: Does the park still completely separate the upper deck from the rest of the park? I recall that being so in the 90's much like the old Yankee Stadium keeping the bleacher rabble separate from the rest of the park, something which was discontinued in the new park. That's the most sizable fault I would think of with the park, although I've never had to travel there. Back to "current" events. I think it was less a matter of the inspiration changing and so the team must change to suit and more that the style is dated, the beer companies shying away from it being evidence of that. Funnily enough, most beer companies are moving to simple updates of old styles, much like the navy/yellow Brewers. That blue on red just blurs too much. It's fuzzy and dark/drab even under the bright night lights in that pic. People had just been speaking on (and I agree) how the Mariners' wordmark looks better with the added outline in between, adding readability. That being said, their identity is very modern and multiple outlines fits with that, whereas this one is more classic. I agree. We should stop playing ball indoors. I'm getting flashbacks to the NOB looks like a beer league team vs. NNOB looks like a beer league team. I'd never thought about Cincinnati's location or really the general location of a lot of teams beyond their state and city until I went to Kentucky to preach in unassigned territory. When I was at a supermarket, I saw bags of peanuts with the Reds logo on it and realized "Oh! That is the closest team, isn't it? I'd just always imagined a demarkation line between North and South running along the northern borders of Virginia, West Virginia, Kentucky, and Arkansas with everyone between that line and Jacksonville being Braves fans. And when it comes to chili, I prefer the Greek Texas sauce on three Texas Wieners with everything and cheese from Newburgh Lunch. Makes sense. Did Ozzie do the flip on the road? I could understand it just being a home thing since that's where the fans are mostly. You'd have to photoshop to get both the blue and make the fun pun. Much of the logos used for these caps have been retro logos, including both options the Braves went with. Am I the only one who just sees a treble clef in that S? I can't tell if that's a good thing or a bad thing. That looks a bit thick. Is that the size of the wordmark and outline together, or is it just that the mark is thinner now? It just feels a little too thick, which makes it feel blobby. Perhaps the smaller type is why I prefer the print/Kansas City/Chambliss home run variant. That being said, I think powder blue was interesting. I wouldn't want it on certain teams, but for teams that wore it, especially for teams that have such a history with it, I think it's fine. Looking at the uniforms of the day, I think it went well with blue, red, and yellow, but don't think it would fit anyone else. Perhaps that's why I always chafe at people suggesting Tampa Bay adopt the Tulane colors. It feels like it should go with blue and a lighter color. I wouldn't want to see it anywhere near the Orioles, Giants, or A's (for multiple reasons). But, I don't actually know if that's because of the aesthetics, or because that's how it was worn in the past and I'm hardwired to accept it. This is the first time I'd seen the Marlins logo on black. I hadn't really thought of it as an attempt at leaning into the neon effect. Now all I see is this: I've always been a phan of the Phillies set. It's unique, it's full of character, and it's got about as much winning behind it as the swirly P. Darkening the red may be a good move, although I'd keep the blue light and go for more a deep scarlet than the full burgundy. Although I admit that the burgundy and white is a really good-looking combo. Maybe it's just like the Pirates sleeves/vests, the Reds Red Machine/Pinstripe vests, or the Diamondbacks purple and teal/red and sand. Two looks that look equally good and both have enough reason to be the current look. However, that description of the current set by BBTV made me realize something as I look at the Phillies' identity. They were the first Brandiose team. It looks just like a Brandiose-created identity. I find that team identities seem to fit into certain time periods that suit them best. I think the best example of this is the Twins, whose TC insignia just exudes 60's streamlined googie aesthetics, something that the uniforms they've moved to when leaving the dome have leaned into and really the ballpark as a whole. But that fits well with their birth and the time period that their biggest legend played. The White Sox are a team with paradoxically a lot of history and a lot of non-history. I'm finding a lot of the things I'm writing in this post intersect. Powder blue is something that I think is okay if it's worn by a team that had history or has a... temporal identity that fits it. The Mets, Twins, Dodgers*, and Astros are firmly entrenched in the early and mid 60's. The Yankees, Red Sox, Giants*, and Tigers look out of the 40's and 50's (at home at least). The Rangers, Mariners, Rockies, and Angels are all of the turn of the millennium. The Diamondbacks, Marlins, and Padres look very now. All of those looks would ill fit with a powder blue uniform. The Cardinals and Blue Jays are in this weird situation where they are modernized versions of older looks. The Cardinals are in a way both modern and classic. It's design that harkens back to the first half of the previous century but has a number of additions (the yellow, the detail) that were added during that time and modern embellishments such as the serifs. 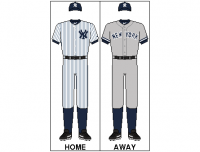 They're like the neo-classic ballpark of uniforms. Either way, these teams look much like they did back then so throwing out a powder blue alt kinda fits. Same for the Royals who are not far off from wearing the same uniform they did in the 70's and 80's. That being said, throwbacks/fauxbacks where they change the uniform to fit the look of their old powder blues or uniforms of that era make it work better. The Rays are a weird outlier in that they invented weird fauxbacks and powder blue is a team color as opposed to an equivalent to away gray. *Yes, I know the Dodgers uniforms were essentially the same for a while in Brooklyn before moving, but while the Giants created a SF logo that fit the aesthetics of their earlier identity, the LA mark is very, very of the 60's. 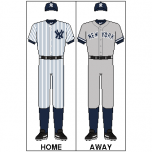 The Mariners are wearing a dark color, a light color, and a metallic. They are playing under a roof where these uniforms barely see the light of the sun. I find it funny to hear that they should stick with what they've got and never look back at royal and athletic gold while the Brewers who wear a dark color, a light color, and a metallic color and play indoors have aged, look drab, and need to go back to royal and athletic gold immediately. And there's one less team wearing purple in the NBA than most think because the Lakers actually wear "Forum Blue". Maybe the logo will be in team colors on the caps? White for Yankees and red for the Sox. Hence the black basic logo. Here ya go, @OhiOsFan17. That's more like how long it should take. EDIT: Oops! Forgot the Harridge Trophy for 1983. Jeez. And I thought last time's gap was embarrassingly long. Sorry, guys. It's been a rough and busy month. @clonewars2008, the Junior medals gave me a little trouble because there's far less information on them than the Olympic ones. Hope these are to your liking. Also, you'd missed a couple East cups there. @MBurmy, I'm sorry you guys didn't make it further. Would have loved to have seen you win the whole thing... or LA... or Colorado... or really anyone else. @simtek34, I've never had conference trophies for the WNBA because I couldn't find any pictures or information on them, but this sent me back and I was able to get what I needed! I'm sorry, @Mybug, this took entirely too long. Got this done on Monday, but didn't realize I didn't upload and post it, and then every time I tried to, something would come up. Some of the numbers you gave me weren't right. There was a missing Astros division win and a non-existent Saints division win. Here's the image with everything. Huh... Isn't Wahoo supposed to be gone by the game next year? Maybe they'll lean into the rock branding in the time leading up to the game. There were options. Much less stupid options. Gary Carter doesn't get his number retired by the Mets because the Hall wants people to remember the Expos but Thome can put a logo on his plaque he might have worn during the one month the two coexisted in Cleveland. Really representative of his career. Always good to have a fact checker. Thanks. Got halfway through that list and forgot a team, so I went to look up all the Florida NCAA teams, forgetting that I started the sentence talking about pre-Dolphins team. What ever happened to logocast? I started listening to it regularly at work and suddenly it disappeared off the face of the earth with nothing about it that I could find at the time. *sigh* Well, this explains why I couldn't like his response in the MLB Uniforms thread. It's pretty simple, and those in power have explained that they felt they had no choice and pretty obviously stated they were planning on making policy decisions to reverse this. It might have taken a few days to a few weeks, but it would have gotten done. Any fighting against it would only serve to give evidence to why they shouldn't do it. All anybody had to do was be calm and let it happen. I hope that the response hasn't colored that decision. We'll see how it goes. Makes me wonder how often contrasting catcher's gear (gear that's not a team color) has been worn by players. I can think of one obvious instance. I love it. Was disappointed there were no references in the new ballpark to the one distinguishing mark of the old one, not even rebuilding it in the concourses like how the Busch Stadium II scoreboard was erected in the walls in Busch Stadium III. I had not earlier noticed the line above the crown. Is that meant to be an ermine cap, or just the stitching of the patch that was used rather than stitching along the complex top of the crown? I actually dig the look of the crown with a blue ermine cap. Would be a lot easier to reproduce. Dat outline, doe! It's the same at Texas and half the US. Football will be chief there because it's a football town. It has less to do with the team's history there and more to do with the SPORT'S history there. Florida had the Gators, Seminoles, Hurricanes, Owls, Bulls, Knights, Panthers, and Rattlers long before the Dolphins. The people love football so they'll support it even if the team's no good. The A's color scheme is god tier. Often people clamor for the lighter colors, but I think it's served very well by the contrast between dark green and light yellow. It emboldens both colors and also contrasts well against the white. But that being said, my favorite color schemes are the schemes that contrast. Dark navy and white. The same with red being a middle shade. Blue and orange and purple and yellow, which are color wheel opposites. The dark green, yellow, and white mix much like the navy/red/white. The lighter green is a beautiful shade, but I don't feel it has the same contrast as the dark green. To be honest, I'd like to see it used with black for another team. Perhaps if a new team were to be put in Portland or Vancouver. It's hard to tell at that scale, but is that the newer version with the white and yellow piping? Because that should never see the light of day. Different worsts. New York and Boston have loyal fans that the voters consider pricks. Do the people in Chicago call Jordan a traitor because he isn't an owner for the Bulls? It had nothing to do with Jeter I think the majority of Yankees fans know that. I'm not sure how many Marlins fans know that, though. Loria screwed the team with his contract. Stanton's no-trade agreement gave him the power and he made the decision. For some reason I can't like this post. So consider this a sixth like.